Turn your attempts at container gardening into flourishing successes with tips, tricks, and secrets from an expert. Container gardening is a great alternative to traditional outdoor gardening for so many reasons, not least because it requires less time and money. Still, filling a planter or other container with flourishing plants straight from the garden center is easy; successfully maintaining those plants for a while is a whole other story. And actually crafting a container garden that’s completely photo-worthy, with #nofilter? Forget about it. If, after initially planting in your container garden, you never touch it again (except for watering it), your container garden will never look the way you want it to. Instead, consider adding more plants over time—or pull plants that aren’t working out of it, McLean recommends. Just because you planted something a month ago doesn’t mean you have to keep it, especially if you’ve realized you don’t actually like it all that much. One of many good things about container gardens is that they’re full of separate plants, which are easy to pull out. Once the plant is out, putting something in its place is simple. New plants are available in garden centers and nurseries each season, so there’s almost always something new you can experiment with in your container garden; the employees at these plant stores are great resources, McLean says. If you like the plants but aren’t sure about the container medium, she recommends moving the container around, putting different plants in it, or arranging it with other containers. Even the addition of a non-plant object, such as a branch or a small ornament, can give your container some life and artistry. Don’t give up on your container gardening dreams the moment a plant wilts or at your first realization that you don’t love the way it looks. McLean considers a full season—about three months—the benchmark for giving a container garden a good shot. If, after that time and some experimenting, you’re still not sure about your indoor garden, it may be time to take things outdoors. Watering your container garden leaches out nutrients, and the soil has no way of renewing itself; to make sure the soil has plenty of nutrients for your plants to absorb, you’ll want to consistently fertilize. Changing out the soil every time you restart your container garden or adding fresh soil when you add a new plant will also help, as well as stop pests and diseases. While a container garden with a single flowering stalk in it is, technically, a container garden, it may not be the wild, lively look you’re going for. Consider adding foliage plants—ferns, grasses, or large-leafed plants—to keep your container garden looking healthy, even after any flowering plants have lost their blooms. “Your leafy, interesting leaves’ texture, shape, and color that will really make your container feel like a great investment,” McLean says. Even if you’re sure about your plant selection, it will take some time for everything to grow in and fill out. A little of what McLean calls top dressing can help make your container garden look finished, even during not-so-pretty growing phases. McLean suggests using grit, mulch, pebbles, or even pine cones—whatever small addition you can find will help the container look finished. Inconsistently watering your container garden—say, forgetting to water it for two weeks then trying to make up for your plant parent neglect with lots and lots of water—can lead to root rot. This can kill your plants, especially if your container doesn’t have drainage holes at the bottom and moisture is able to build up. Drainage rocks or another absorbent material can help wick away extra moisture, protecting your plants’ roots, but a watering routine—especially if it includes regular fertilization, too—will do wonders for your container garden, even if it’s full of drought-resistant plants. 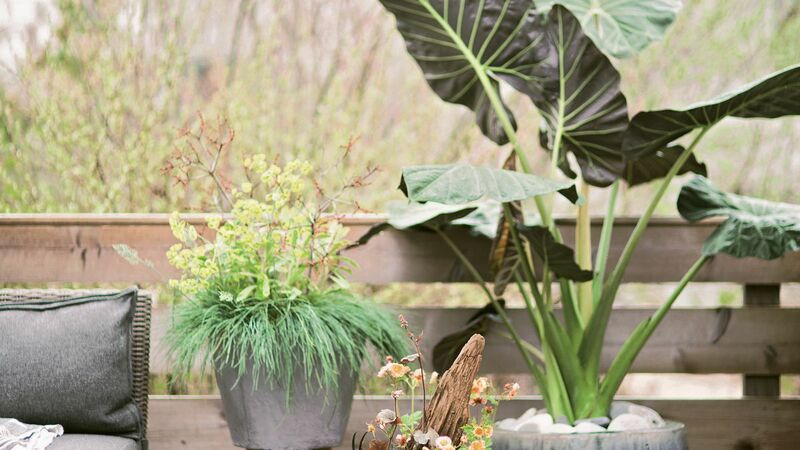 Terrain’s team of green thumbs—including McLean—is behind the gorgeous plants and plant accessories you’ve likely spotted around Anthropologie and around the internet, and the garden resource recently launched its first book. 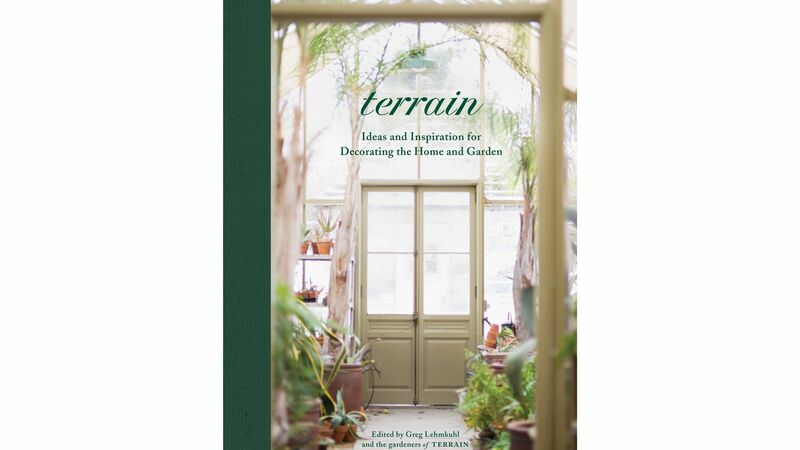 Terrain: Ideas and Inspiration for Decorating the Home and Garden ($35; shopterrain.com) is available now and includes 350-plus pages of container gardening ideas and tips, garden inspiration, and more.